It sure sounds interesting to talk about the wallpaper for the ceiling, rediscovering a brand new area to use wallpaper and brightening up that part of the wall most where you spend maximum hours of your sleepless nights staring at. In case you are unsure how to go about it, we have some simple and easy to follow solutions that will surely ease the entire process for you. Just let us take charge of revamping your ceilings with our brand new decoration initiatives and you will soon be looking forward to your nights of staring at the ceiling. The big positive of hiring our service for ceiling wallpaper installation is an assurance that you will get a perfect installation coupled with long-term benefits. Our labour forces and employee quality continues to be our biggest strength. We never compromise on them. It needs special skills and technique to paste paper horizontally on the ceiling. We have a well-trained staff and employ the latest techniques. We select only the best talents, premium training is provided to help them rise to the level of individual masters in their chosen field of specialization. Our success is acutely linked to the degree of their competence. Our design strategy is simple. We use motifs and prints, colours and combinations that serve as wonderful visual treats both from a distance as well as on close monitoring. The special glue needs to be used for the wallpaper sticks properly and does not peel off. We use a superior brand which is not commonly preferred. It is very important that we follow a standard operating procedure to achieve the maximum amount of perfection and finesse. Our team has incorporated a specific set of a working module, especially while pasting ceiling wallpaper to achieve this finesse and conform to our no slack policy. The wallpaper needs to be arranged in a way that the pattern comes out clearly. Ensuring symmetry is critical, and we leave no stone unturned in achieving it. Leaving loose ends and untidy finishing can mar the best of wallpapers; you will never face that problem with us. So all you need to do is dial our number or send us an email with specific details and the timeline in which you plan to get the job done. 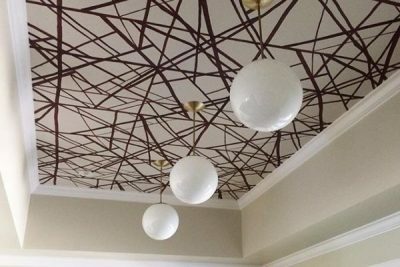 Once we take charge of your ceilings to rest assured that we will incorporate changes and use ceiling wallpaper in a way that thoroughly revolutionizes decoration practices as you had known it thus far. You can rest assured that next time when you enter your room, you will be absolutely floored by our creation.